The pictures on this page illustrate Week 11 of our free internet meditation course. 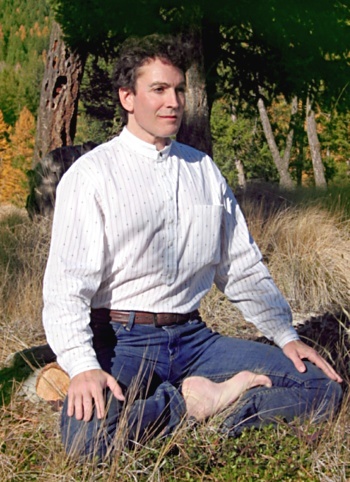 The magician posture is similar to the siddha posture, but is more stable. It requires a little more flexibility. One foot is drawn up onto the opposite calf. The lotus position is the iconic symbol for meditation – but it is wrong to suppose that it is the only proper position, or the best one. It requires great flexibility in the hips. If it is not easy to enter this position, do not attempt it without guidance – injury can result. 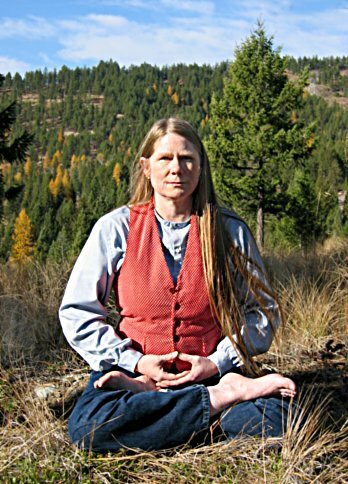 The main advantage of this posture is that it does not require a sitting cushion, so you can sit directly on the ground. This posed photograph is misleading in that the hand position is that suitable for shi-nè, but her eyes are wide open. Generally the eyelids should be lowered for shi-nè meditation.